Whether you see them as a status symbol, a chronicle of personal achievement or just a flashy way to rep your own personal style, you've got to admit that they're a big deal around The Escapist. With that in mind, we'd like to take a minute to call out the Escapist Badge Hunters group, a merry band of friends that have dedicated their time on-site to seeking out and cataloguing the wealth of badges floating around out there in the Escapist ether. 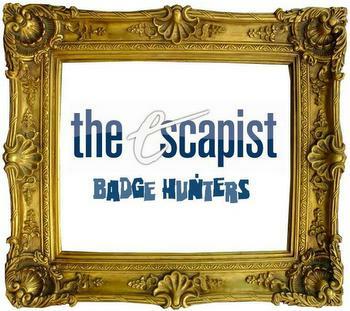 Who are the Escapist Badge Hunters, and how did they come to be? Assist in figuring out how to earn certain badges. One example of this is the DDKR Champion badge, which was figured out after much organisation by SirBryghtside and help from many community members watching various episodes of The Escapist Show to see who got the badge. Help users obtain badges, through displaying the badges and how to get them in the Escapist Badge Gallery, giving more clues or advice on how to obtain badges, or even helping directly by befriending others or organising battles in Genre Wars together back when it existed. And finally, we also just talk about badges: Ones we want, ones we're proud of etc. As for how we began? Well, badges themselves have been around since August 2008 and the community of it really began about half a year later when a good friend of mine called Nivag made the original Badge Gallery. Back then the gallery was a guide, the idea being that it was where anyone could go to get advice for any badges either from the thread itself or from its regulars. After user groups were first introduced to the site, Nivag created the Escapist Badge Hunters, a user group with the same cause as the guide and also a more convenient way of doing news announcements on new badges. However, over time the group became more used than the thread. So Nivag changed the thread to being a gallery for displaying all the badges, instead of being the definite place for help with badges. We also made it a bit fancier with banners and stuff at that time. What role do you play in the Badge Hunters community, and how did that begin? I am the owner and manager of the Escapist Badge Hunters (unofficially called the Head o'Hunters). My job is to keep the gallery maintained as new badges come in and other badges expire and also to keep the user group under control, though the latter is rarely required. Shortly after the group started Nivag decided to ask some people to become admins so that he wasn't the only one announcing badges. Because I was fairly regular at the time he asked me if I was interested, and I was the second member to be made an admin (the first one eventually left). As time went on Nivag was becoming busier and busier in real life, and eventually he asked us admins for someone to take over as group owner. I was already doing a lot with the site as I was still a moderator back then so I told him I was interested. I became owner in January 2011 and the new gallery was made in May 2011 after I left the moderation team and could no longer simply edit the original gallery. How has the user group changed since it was first started? We have become a smaller group of regular visitors nowadays. We did have a massive surge of members shortly after forming as we were the Featured User Group for quite some time (this was before the Featured User Group articles started, so I can't back this up with a link). This placed us in the top ten groups with most members, but it has since then turned mainly to surges of activity on Mondays when the weekly quiz badges come about. Saying that however, everything can change between this featured article and all the new XCOM game badges. What do you like so much about Escapist Badges? I personally like them as a record of what I have accomplished on this site. After three years it's hard to remember everything you have done as part of a userbase, and badges are a way of remembering and showcasing some of the things I'm proud of having accomplished. What are some of the group's favorite Badges? The group is often quite fond of the more mysterious badges. The OMG Pony!1 badge and the DDKR badges were good early examples of this, and we still see it with The Beard Badge, Lol... wut? (one of the very few badges which the Hunters never worked out) and, of course, Rainbow Powah!. The Escapist Badge Hunters are the crew of a pirate ship. Describe some of your journey to us. Hehe, my phone camera is terrible. We are the finest treasure hunters you have ever seen travel the high seas! No map is too complicated, no puzzle too confusing and no film reference used as a clue too obscure for our men to crack. We travel anywhere and everywhere. No matter where the waters take us, we take all the gold we can lay our hands on, and even help others find their precious booty. As long as we get a share of the takings, of course. Now, I'm afraid we must be off. The wind is calling us. First mate Bryghtside, take the wheel! AwesomeExpress, ready the cannon! Frappe and oppp7 man the rigging! Onward ho! So yeah, kind of like that. What are some badges that you'd like to see more of? I would personally like to see more badges about featured content by members of the community. Since we haven't had Letters to the Editor and guest reviews for over a year and things like the RP Digest haven't been around for even longer (though I do know why the RP Digest stopped), it feels like the site isn't taking advantage of some of the brilliant writers in the community as much as it used to. That is already kind of changing with the featured user review on the My Escapist page, but I do think badges would also work as a good incentive to get people to write more high quality content with the push that an achievement would come as a result of it. Users featured in this article: Zombie_Fish, SirBryghtside, Nivag the Owl, oppp7, AwesomeExpress, Caramel Frappe.